The likelihood of David Pocock and Michael Hooper playing in tandem from the outset of the Rugby World Cup has only increased with news that Wycliff Palu battling a hamstring injury. Michael Cheika is expected finally to unveil his first-choice side on Monday, when he must name his team to play their World Cup opener against Fiji at Millennium Stadium in Cardiff next Wednesday. He's kept it carefully under wraps while chopping and changing his side throughout the five-Test lead up campaign, but he has confirmed that Palu is probably out of contention as the 56-Test veteran No.8 has a hamstring problem following the intense two-week camp in the US. "Cliffy has a bit of a hamstring, but he ran today," Cheika said following a welcome ceremony for the team in Bath, the Wallabies' base for the next 10 days. "I don't think he'll be right for the first game but he should be OK for the second game." Cheika refused to say which way he was leaning over his all-important halves combination with Will Genia and Nick Phipps battling for the starting half-back role and Bernard Foley and Quade Cooper for the five-eighth berth. But it seems likely that he has always been intending to start Pocock at No.8 with Hooper at openside flanker after that exciting combination excelled in the win over the All Blacks in Sydney. ESPN is proud to announce an exclusive 1-hour special - Cheika's Wallabies: Hope of a Nation - with a repeat broadcast on ESPN Thu Sept 17 at 7pm AEST (9pm NZ). ESPNscrum's leading rugby expert Greg Growden goes one-on-one with the Wallabies coach in this exclusive special that gives a rare insight into the intriguing personality of Australia's head coach. 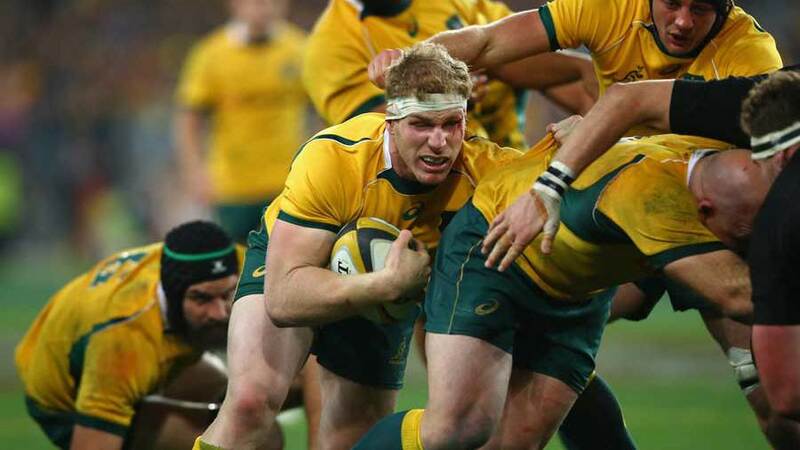 "They were successful on that night [in Sydney] ... and we've got a good idea of what we want," Cheika said. "After the [Rugby] Championships we sat down and worked out what we wanted our team to be. We're still putting some things together but we still have a fair few days before we play the first fixture." Skipper Stephen Moore believes the two-week stint in the US provided the perfect preparation despite the temperatures being a lot higher than those that greeted them in the UK when they arrived on Monday. "We were a bit removed from it in the US, all the talk there was the NFL and the college football which they are all fanatical about over there," Moore said. "We flew under the radar which was good ... but it was pretty hot over there and decks was quite hard but we got some really good work done over there at Notre Dame University where we were based." Success in the Rugby Championship saw the Wallabies climb to No.2 in the world rankings but Moore admits the team are still under pressure not only get out of a pool that contains England and Wales but also to reach a first final in 12 years. "We certainly feel the sense of occasion now we are here," he said. "We've got a lot of expectation internally about what we want to achieve and also from the support we get at home. Being in Bath we are a little bit removed because London is going to be the centre of attention and that is quite nice."